more orphans than ever...4 million new ones this year in India! 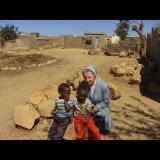 new ones...working to help these children and other orphans in Ethiopia, Eritrea and Brazil live a life with dignity. AIDS Orphans Rising will introduce you to children, orphaned by AIDS, and struggling to keep their family together. Most policy guidelines for children portray these children as victims, dependent and powerless. Little attention has been given to the positive aspects of these children's behaviors and how they have been able to take control of their lives. In this book you will see brothers and sisters from one to eighteen to years of age fighting all the odds to stay together. It is not a sad story. For them this is life; they see it all around them and they see those who get up and go on survive! It is a tremendous story of courage, of children willing to forgo education, and their childhood itself for the sake of their family. This is the story of children that with a little help and love will grow up to be fine citizens of the 21st Century.